Four-time champion John Higgins has called himself a snooker "journeyman" after his first-round exit from the World Championship. 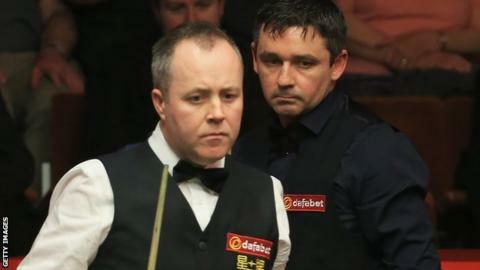 Higgins, seeded 11 at the Crucible, was defeated 10-7 by fellow Scot Alan McManus. The 38-year-old has not won a ranking tournament since 2012. "I'm maybe not one of the top players challenging for every event - I'm possibly a journeyman top-16 player now," admitted Higgins. "But those journeymen can have their day sometime." It was McManus' turn to have his day in the first-round encounter, thwarting a Higgins fight-back to win in Sheffield, but the former world number one was remaining upbeat considering his exit. "It's been bad," he said of his season. "But I'm a lot happier this year than I was last year when I lost to Mark Davis. "I can definitely see signs and I'm playing better than I have been in the last year or two. That's the crumb of comfort I can take. "There have been times when I've been sitting here desolate thinking that there's nothing at the end of the tunnel, but I definitely think I've got some decent snooker left in me." Higgins had said before the match that he believed his form was returning. "I was feeling good coming into the tournament, but sometimes matches go that way and you can't get into it," he said. "I am disappointing the way it finished because I was feeling pretty good and I fancied my chances if I made it 9-8. "I knew I've got some decent form inside me but just couldn't bring it out in the early part of the match." McManus, a former Crucible semi-finalist, has staged a career revival and is back at 35 in the world rankings at the age of 43, thanks to an expanded tournament schedule. "He maybe doesn't hit as high breaks as he used to, but his tactical play round the table was really good and basically froze me out," said Higgins. "He has been in the wilderness for the last couple of years and I think, the way the new system is, it helps the likes of Alan because he likes the bigger stage while he was maybe struggling in the qualifying." McManus, who plays 1997 champion Ken Doherty in the second round, was becoming concerned after Higgins went on a run of three frames. "I scraped over the line in the end," he said. "If John starts relaxing and putting his arm through the white the way he can do, then it is like trying to tame a lion at times. "Fortunately, I just got a couple of chances near the end that I badly needed. "Even to practice with John is just a thrill, frankly. I hold him in such high esteem as a guy and as a player - he is a legend of the sport. "To play him here was a really special thing for me and to win is a bonus."